Serena is our amazing baby alpaca & cotton blend. This yarn isn't as well known as some of the others in the Manos line, because it is newer, but it has already won our hearts completely, and yours as well, if its terrific sales in its first season were any indication! 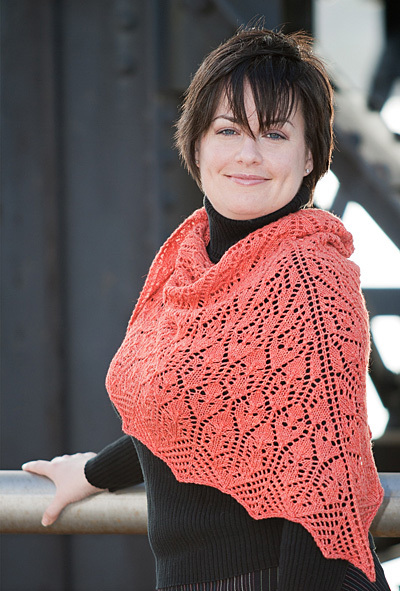 It knits up at Sport Weight which, combined with the luxurious softness, makes it ideal for a shawl or other fancy accessory, as exemplified so well by the Pretty Maids pattern from the most recent edition of Knitty! Another reason this yarn is great for shawls is the blend of fibers. The cotton content brings its all-seasons wearability to the yarn, while the alpaca fibers bring their loftiness and luscious drape. The fact that this yarn combines both cotton (a cellulose fiber) and alpaca (a protein fiber) makes the colorways special, too. The two types of fibers take the dye a little bit differently, so the finished yarn shows a nice heathered effect where the fibers blend their two shades together! You can see this effect a little more clearly in the close up of the Zinnia colorway below: Because of the lovely heather effect, I already love the colors of this yarn. But the Serena story gets even better - we're coming out with a new round of colors for 2011! The new selections should balance the original palette of chalky and summer tones with some deeper, year-round colors. I'm really looking forward to the expanded palette. It'll take this already versatile yarn and give it legs to appeal to an even wider range of project types and knitters or gift recipients!